Homicide is the killing of a human being, and comes in various degrees, including first degree, second degree, voluntary and involuntary manslaughter, and defenses such as self-defense, accident, etc. The issue is intent, whether it was a premeditated act with malice, all the way down to an accident that involved behavior constituting serious risk to life. In defending murder cases there are usually two avenues of defense; one, somebody else committed a crime, or two, the defendant might have done the killing but there are mitigating factors such as lack of the necessary intent. Violent crimes other then homicide can also be defended in one of two ways; either somebody else did it, or the requisite intent was not present. For example, assault with intent to commit great bodily injury might only be a misdemeanor. Assault if there was no intent to commit great bodily injury, or shooting at an inhabited dwelling might only be an accidental shooting with no specific intent to harm anyone. A creative lawyer is always looking to find mitigating factors involving intent, even including psychological issues where possible. 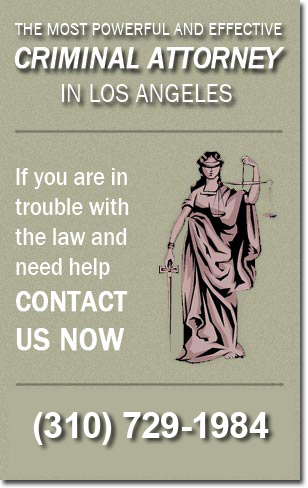 If you are in trouble with the law, contact criminal attorney Alan Fenster immediately! Call our Beverly Hills office at (310) 273-3661 to schedule a free initial consultation. Alan Fenster represents clients in Los Angeles, Beverly Hills, Santa Monica, Culver City, South Bay, Glendale, Pasadena, the San Fernando Valley, and elsewhere in California as needed.